Perfect for securing employee communications and/or customer comments. 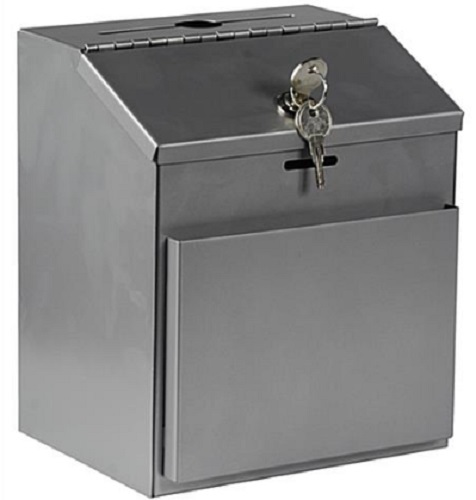 Also ideal for securing collections/donations. Tumbler lock with two keys. Comes with a pack of 50 yellow suggestion cards (extra cards sold separately, #5621) and a chain pen. Pen can be placed anywhere on the box for convenience. Sits on table or mounts to wall. Hardware and a suggestions label included. Slot measures 6-7/8" x 3/4" and has a center slot for keys. Side pocket measures 4-5/8" x 1/2" x 5". Medium oak finish. Perfect for securing employee communications and/or customer comments. Also, ideal for securing collections/donations. Tumbler lock with two keys. Includes a pack of 50 yellow suggestion cards (extra cards sold separately, #5621) and a chain pen. Pen can be placed anywhere on the box for convenience. Sits on table or mounts to wall (hardware not included). 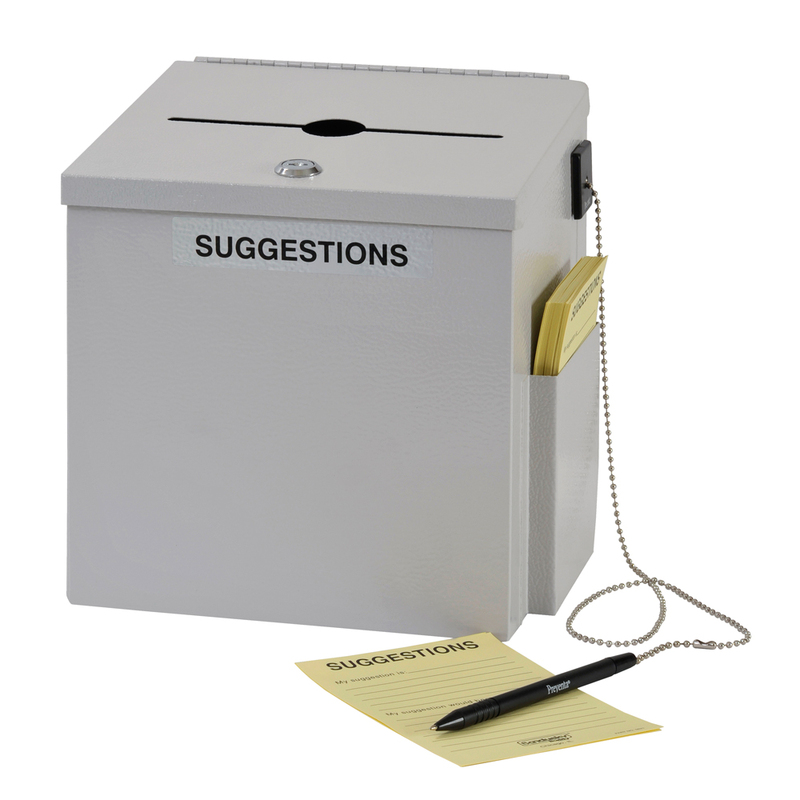 "Suggestions" label included. Made from textured steel to resist scratching. 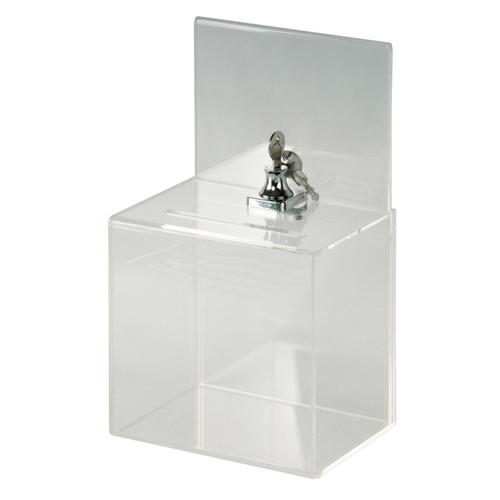 Slot measures 6" x 3/4 and includes a center slot for keys. 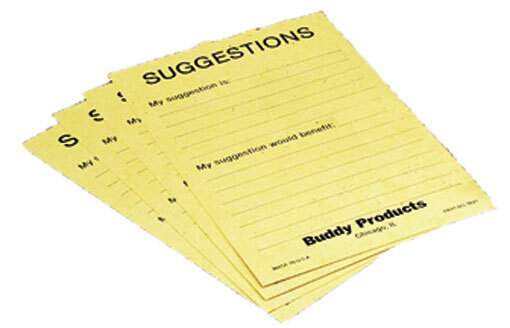 Yellow suggestion cards come in a pack of 50 for the wood and steel suggestion boxes. 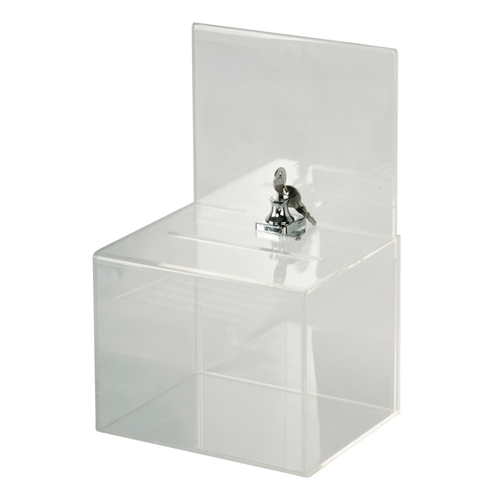 Locking table top acrylic suggestion box allows for the collection of ideas and messages or collecting donations. A plexiglas panel above the box allows for a sign to be displayed for the occasion. Includes lock and two keys. Overall Dimensions: 6.3inW x 4.7inD x 11inH. 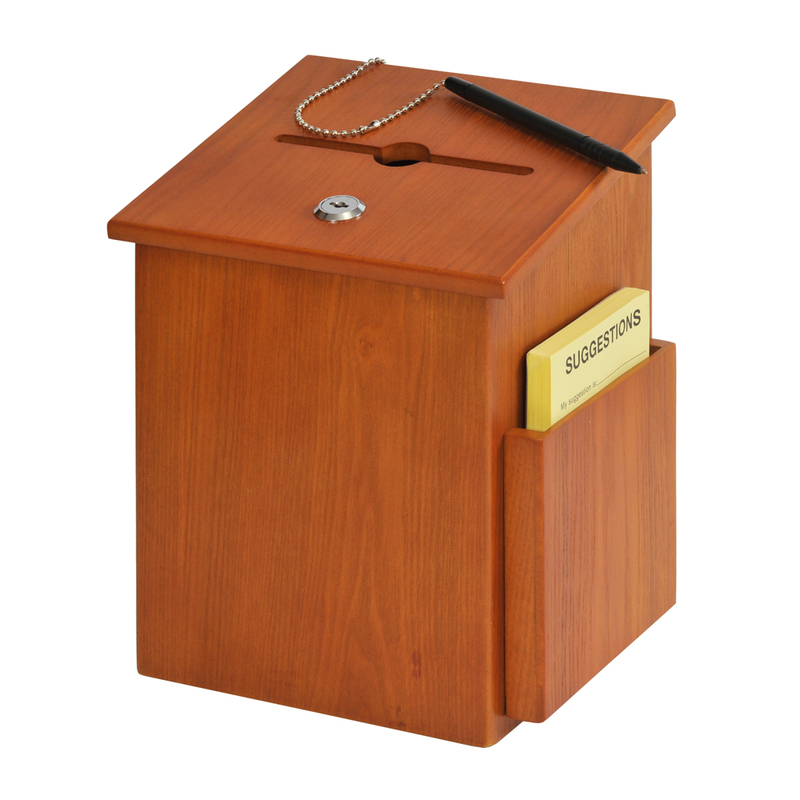 Locking table top acrylic suggestion box allows for the collection of ideas and messages or collecting donations. A plexiglas panel above the box allows for a sign to be displayed for the occasion. Includes lock and two keys. Overall Dimensions: 7.9inW x 6.3inD x 12.6inH. To compare several categories within Safes & Specialty Storage, click on View All Safes & Specialty Storage.